Any Video Recorder can capture streaming video, films, music videos, online TV shows, live sports on NetFlix, Vimeo, Hulu, Metaface and other similar feed sites with high output video quality. Record DRM protected iTunes rental or purchased videos, capture screen video or desktop activities, record protected DVDs and videos played on VLC, KMplayer and more are also available for you by using Any Video Recorder. 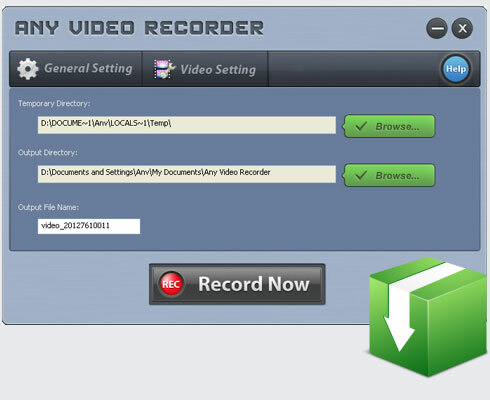 It is quite easy for you to free record video, audio, images and anything you want. Now, just download Any Video Recorder and win a totally barrier-free video recording experience. No AD, no watermark, no plugin, no undesired subscription. Get Any Video Recorder Free and enjoy it now! To convert iTunes movies at lossless quality, try iTunes Movie Recorder. It is a powerful iTunes DRM removal tool aiming to convert iTunes M4V videos to MP4, MOV... at 20X fast speed with 100% lossless quality. Besides, it can retain AC3 5.1 audio track and all multilingual subtitles after conversion. To losslessly convert any iTunes Apple Music and M4P audio files at up to 20X faster speed, try Apple Music Recorder. It could convert all of iTunes audio files and audiobook files at unbeatable fast speed and support batch conversion while keeping ID3 tags. To legally download and convert Spotify audio files without lossing quality, try Spotify Music Recorder. It is the smartest audio DRM removal tool designed to convert Spotify songs or playlist to MP3, AAC, FLAC or WAV format at 5X fast speed with 100% lossless quality. •	XGA (800x600) or higher resolution monitor.